Your body needs energy to recover after a workout. Especially if you work out at a moderate to high intensity for an hour and a half or longer, you need to replenish lost carbs, sodium and potassium. You should have a nutritious snack within 15 minutes to one hour after rigorous exercise, recommends the American Dietetics Association. 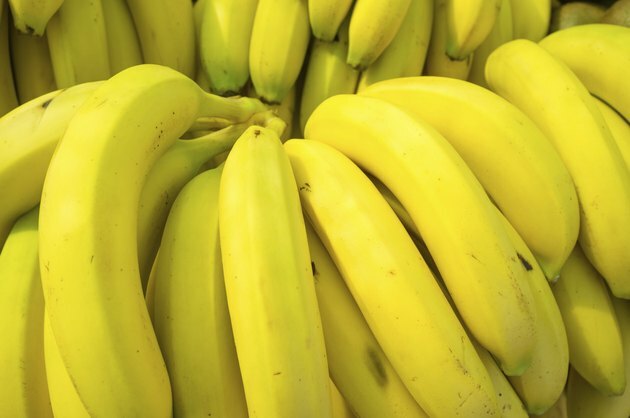 A banana meets these requirements because it's rich in potassium, magnesium and fast-working carbohydrates and it's especially beneficial after a jog, when coupled with a source of protein. One medium banana contains about 110 calories and 30 grams of carbohydrates. Carbohydrates are the main fuel your body uses for moderate to high intensity activity, and after your workout you need to replenish them so your muscles have the energy required for recovery and for your next workout. Since the carbohydrates in bananas are from fructose, they're high-glycemic and convert to usable energy quickly. Not giving your muscles their main energy source -- carbs -- when they need it most could potentially cause painful cramps. The American Dietetics Association also recommends that you eat protein after exercise to help repair your muscles. When you eat a banana with some protein, the simple carbohydrates in the banana give your body the energy it needs to start immediately utilizing the protein for muscle recovery. Try a tablespoon of nut butter with a banana or make a banana smoothie with milk or protein powder. Potassium is required for nerve and muscle function, and adults need 4,700 milligrams of it daily, according to the University of Maryland Medical Center. Since your nervous system and muscles work hard during a jog, potassium gets used and needs to be replenished after your workout. If you don't replace lost potassium and you become deficient, you could get muscle cramps. Bananas are an abundant source of potassium, which is another reason they're a great post-workout snack. Just one banana contains about 450 milligrams of potassium, which fulfills about 13 percent of your daily requirement. Magnesium is another mineral your muscles require during exercise. When they don't have enough, you can experience cramps, weakness and muscle twitching. Bananas can help replenish magnesium lost to exercise after your workout. A banana contains about 34 milligrams of magnesium. You need about 400 milligrams of magnesium daily, and one banana would provide around 12 percent of that requirement. Does Eating After Exercise Make People Gain Weight?